Are you kids learning multiplication? Mine has just past the stage, but I wish I had this app when he was learning multiplication. Teachley Mt.Multiplis is a great game app teaching properties of operations as strategies to multiplication. We all know the 3 properties of multiplication: commutative, associative, and distributive. I found through my son’s learning process that it is easy for them to know the property, but hard to know how to apply the properties, especially the distributive property. When you present 7×8=2×8+5×8 to the children, they will know it is distributive property. However, when you ask them doing something like 11×16, they won’t realize they can do 10×16+1×16, which will be much easier. 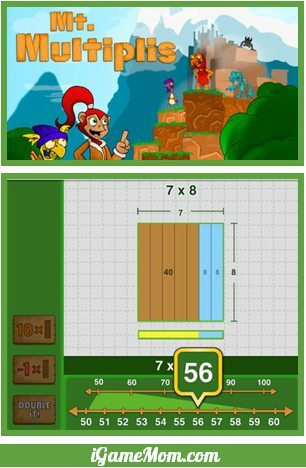 Mt.Multiplis visually teaches kids how to use the operation properties to help them solve math problems faster. Linka the monkey gets caught in a terrible storm while flying home after a successful treasure hunt. She escapes but her plane isn’t as lucky. Help Linka make her way through Mt. Multiplis by building bridges, unlocking treasure, and earning gems. Rebuild Linka’s plane by collecting the pieces from the greedy Crags who live on the island. Each step moving forward requires solving multiplication problems. The app does a wonderful job showing kids visual blocks how the operation properties make sense, and how to use the properties to solve their problem. Kids go through the visual blocks on each problem they have to solve. By the time kids find all the pieces to put the airplane together, they will have a very good grasp on the concept and application of the properties. In addition to math problem, kids also need be strategic on the path choices to collect treasures, gems and coins, so they will always have enough treasure to trade for the airplane pieces they need collect. Mt.Multiplis is a great teaching app for kids who are learning multiplication. It works on iPad.